The La Quinta Inn Bend has been awarded the 2017 TripAdvisor Certificate of Excellence. 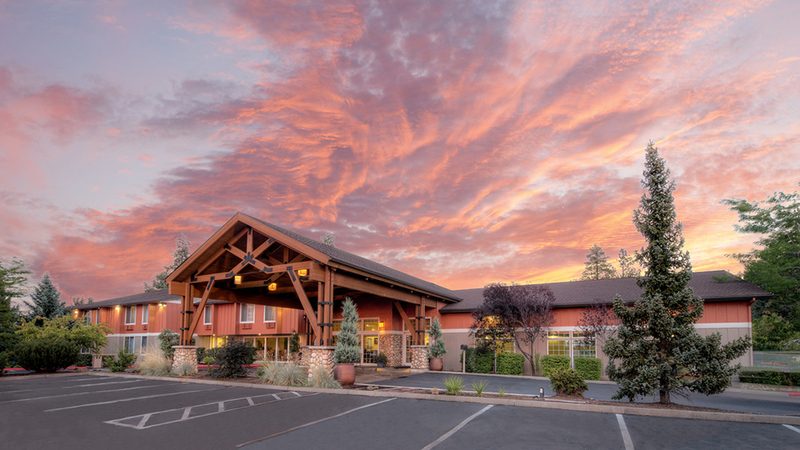 The Northwest lodge-style La Quinta Inn Bend is 100% nonsmoking, and nestled in the heart of Central Oregon, just a short drive from skiing and sled dog rides at Mt. Bachelor. It is easy to reach all popular attractions from here, including downtown Bend for shopping, fine dining and concerts at The Les Schwab Amphitheater. Visit the High Desert Museum, Old Mill District, Lava River Caves, Lava Butte, Pilot Butte, Historic Sisters, the Crooked River Canyon for breathtaking views of the Crooked River Gorge, or, for the climbing enthusiast, Smith Rock. Rooms at the La Quinta Inn Bend come with loads of lodging amenities, such as expanded and premium satellite channels, coffee maker, iron, ironing board and hair dryer. Feast daily on their Free Bright Side Breakfast, and cookies baked fresh every evening. Their sparkling indoor pool and spa, and fitness center, are at your disposal 24-hours. They also have a coin-operated guest laundry facility. Located on south Highway 97, La Quinta uses a saline sanitation process for their pool and spa. Your pets are welcome.